For a while it looked like the record for lowest maximum was going to be broken for the third year in a row, especially after an extreme warm event shook the Arctic. But this anomalous heat was followed by anomalous cold, which was just enough to nudge JAXA sea ice extent above last year's record low maximum. By 13 thousand km2, to be precise, which is around 0.1% of total sea ice this time of year. I don't mind, as I correctly guessed both this maximum's date as well as the final number on Arctic Sea Ice Forum polls, probably for the first (and last) time in my life as an Arctic observer, as the maximum is incredibly difficult to pinpoint. Not a record low maximum, but the fourth maximum in a row that has ended up (well) below 14 million km2. That's for JAXA sea ice extent data (formerly known as IJIS, now provided by ADS-NIPR). The NSIDC has just reported that for their SIE product this year's maximum was also second lowest on record. The Arctic has stubbornly refused to refreeze before, but this is another event we can add to the unprecedented list. After ending second/third lowest on record around minimum time, there was a rapid refreeze that was traditionally touted as the End of Global Warming, but for the past weeks things have been at a figurative standstill. Whatever the respective roles of natural variability and AGW, these wild swings do not inspire confidence in a semi-stable system (and the same goes, unfortunately, for the Antarctic). 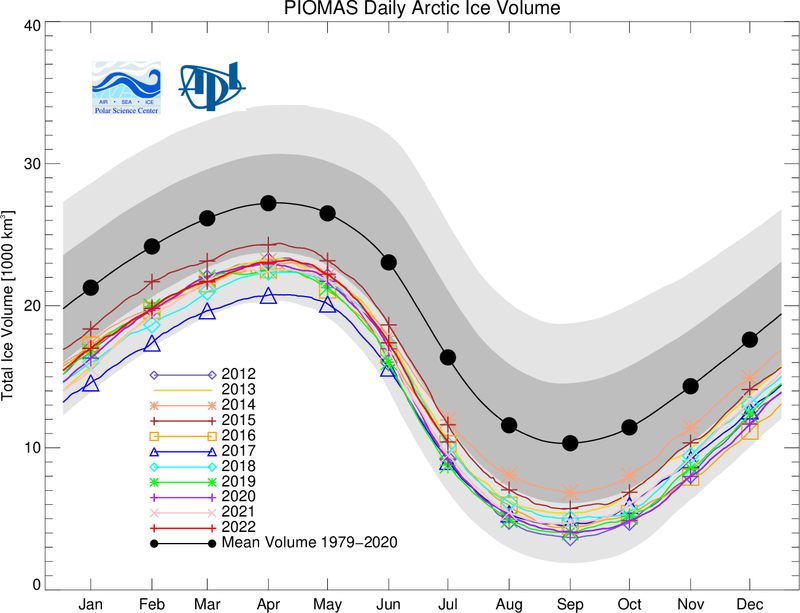 The slow refreeze inevitably has an effect on sea ice volume, as modelled by PIOMAS. As of November 1st, sea ice volume is lowest on record, but this post covers the month of October only, and at the end of that month, 2016 was just marginally behind 2012. But with an increase of just 1648 km3 during October (only 2007 managed to have an increase below 2 million in the past decade) 2016 has left all other years in the dust.